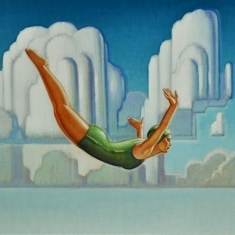 Robert LaDuke’s narrative paintings are a combination of memories, dreams and everyday life. Based on America in the 1930-40s, his art usually includes some form of transportation and features the toys which were popular during that era. He is a painter who uses playful images inspired from childhood memories or dreams to create humorous metaphorical paintings. La Duke explains, “Although realism often dominates my work visually, it is in fact, merely providing a means - a frame of reference - to a metaphoric end.” With his use of often absurd and exaggerated scale relationships of cars or trains, he revives our own vividly playful memories as children but invents enough oddities to amuse us today. 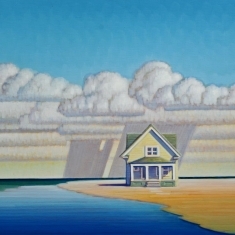 Robert La Duke has a BFA from Art Institute of Chicago and currently resides in Huntington Beach, CA.